John Dowland (1563-1626) was in many ways the most outstanding musician of Elizabethan England. And his Lachrimae cycle of pavans represents some of the most outstanding music of his time, and, indeed since, the music evoking a profound emotional and spiritual journey. Perhaps uniquely in tune with his time, his art found perfect musical expression in the ‘Cult of Melancholy’ that ran deeply through 16th-century art, literature and music. The pavans have their origin in a lute solo that grew into Dowland’s best-known and best-loved song, for which Dowland himself probably wrote the words, ‘Flow my tears’. Last to emerge was the set of seven pavans instrumental based on the same 24-bar pavan-song. Though the exact date of composition is not known, it first appears on a London copyright register in 1604. In them the lute continues to occupy a central part of the instrumental texture, written with the mastery only a virtuoso of Dowland’s stature could have achieved. 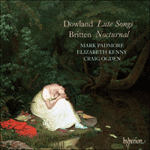 Although Dowland published the seven pavans as a continuous set of instrumental music, the pavans are for this recording interspersed with other songs that highlight the different shades of introspection and melancholy Dowland so delighted in. His biographer, Diana Poulton, sees his genius most exemplary in his late songs, most affected by the operatic invention of early 16th-century Italian opera. Of his ‘In darkness let me dwell’ she cites his ‘strange and beautiful melody, rising from the words, with a sense of inevitablity…expressing an emotional intensity unsurpassed in any other song at that time’. But the seven pavans are likewise music of great originality. They are played on this disc on fretless instruments, and not on the more familiar consort of viols. 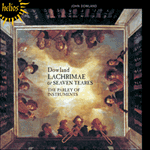 The justification for this need not go further than the preface to Dowland’s own publication of the Lachrimae which specifies that the music can be played on ‘viols or violons’, the latter being unspecified fretless instruments of the violin family. In keeping with common practice for larger musical ensembles until the 19th-century, the instrumental forces in this performance are divided into two groups: one of soloists and a second, larger ‘replenishing’ consort. This formula lends itself particularly well to the formulaic pavans each 24 bars long, and each in three 8-bar phrases, with repetitions. It is not known where the pavans were written, but they may well have their origin during Dowland’s residence at the court of Christian IV in Denmark between 1598-1606, during which time the composer made some 37 visits northwest, to Christiania (Oslo) and to what is now Norway, making a fitting precedent for the contemporary early music performers on this disc to be exploring this repertory. But Dowland, as his ‘Lasso vita mia’ in its Monteverdian style would suggest, was a total European, with roots not only in Elizabethan London and in Scandinavia, but in the new operatic lyricism of his day emerging from the Italian peninsula, that was to change the course of vocal music to follow. Indeed, at a formative time in his life, between his 30th and 46th years, his residence at courts in Brunswick and Kassel in Germany, and his travel to Italy (and back to Nuremberg) before his long stay in Denmark, along with his very early years in France, had established him as a major European musician of his generation. Though the sadness of Dowland’s songs is very personal, it also has a universal appeal. In common with much later slow-moving works of great pathos, like Schoenberg’s Verklärte Nacht, the Adagio of Mahler’s Fifth Symphony or Samuel Barber’s Adagio for strings, Dowland’s Lachrimae and associated songs reach straight out to the deepest of human feeling. Their simplicity and immediacy had great appeal for their own first 16th-century audience. And they may be no less so for today’s listeners, from whom they can unite both the lyric sadness of the late 19th-century romantics and the directness of the contemporary minimalist.